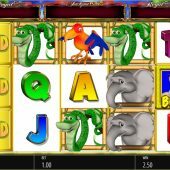 Monkey Business Deluxe slot is very straightforward and if you live in the UK you may very well be able to skim-read this review as there's a chance you've already played it in Amusement Arcades back in the noughties! It was in a Gamesoft cabinet with a £500 maximum jackpot with a cartoon jungle animals theme over the same background with musical reels, punctuated by animal noises when you got a win consisting of them. It's by no means the first arcade slot to make it online, with Astra's old cabinet games such as Reel King and Barcrest's Rainbow Riches and Cashino having made the transition before. So will this particular monkey get up to any tricks with our bankroll though? There are 20 paying lines over 5 reels of 3 rows each here on Monkey Business Deluxe and symbols bar the scatters can appear stacked. There are single Wilds and Expanding Wilds, the expanding ones being why this game is called 'Deluxe' and perhaps necessary for the higher RTP needed for online game versions. The icons pay 12.5x for 5-of-a-kind Wilds or Monkeys, 7.5x Parrots, 5x for Snakes or Elephants with Ace through to 10 paying 1x for a full line. That's pretty much all we see until we get to the feature. For 10 free games you need 3, 4 or 5 Hunter scatters anywhere in view. 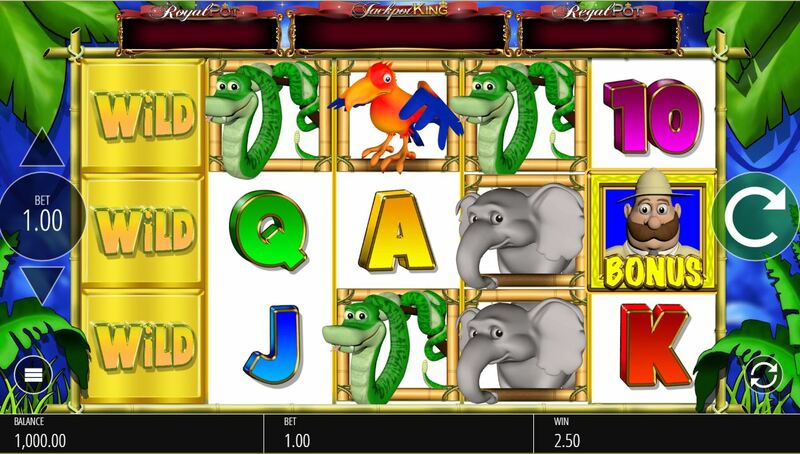 Now depending on the amount of scatters you will play free games with the Monkey only appearing on reel 3 and each time he does, your total win thus far will be doubled, or tripled if you had a 4-scatter trigger or quadrupled for a 5-scatter trigger. There are no retriggers so essentially you're playing the same bonus as Novomatic's Beetlemania Deluxe offers. That's all folks!